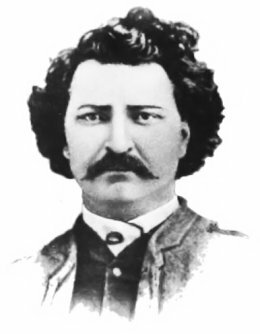 On this date in 1885, Louis Riel, “the puzzling Messianic figure of Canadian history,” was hanged in Regina for treason. We have already met in these pages the magnetic, controversial figure of Louis Riel when his Red River Rebellion caused the 1870 execution of Thomas Scott, one of the soldiers sent to suppress it. Now, after a decade and a half in the political and sometimes literal wilderness, the champion of the Métis had been recalled from the United States to press the rights of his mixed-race French-indigenous people against the Anglo Canadians’ westward march. It was North America’s familiar clash of civilizations between expanding industrial economies and the traditional ways of life they displaced. (Here’s a good background documentary video, with a Part 2 that gets into the weeds on battlefield events.) Because the Metis were “half-breeds” whose European stock was French, the story’s familiar cocktail of racism had a twist of Canada’s Anglo-French rivalry, too. Riel declared an independent Provisional Government of Saskatchewan, and the North-West Rebellion was on. The rebels had some initial successes. But hampered by an inability to make a firm alliance with the more politically realistic Cree, by the non-support of the Catholic Church in view of Riel’s increasingly out-there millenarianism, and by the extension of technological superiority another 15 years’ railroad-building had given the Ottawa government, Riel’s forces soon gave way. The lightning-rod leader was arrested and repaired to the provincial capital for trial, where he spurned his lawyers’ desperation attempt to plead insanity and cogently vindicated his position. His hanging was met with outrage in Francophone Quebec, and Louis Riel remains a polarizing figure down to the present day — an emblem of multiple overlapping cultural conflicts never fully resolved. The upcoming year’s 125th anniversary of events profiled here promise a renewed examination of Louis Riel (or at least of his tourism potential). Below are a few more-or-less obtainable recent books about Riel and the North-West Rebellion, culled from this pdf reading list. Also note the public-domain volume The history of the North-west rebellion of 1885.